The Jewish Museum in New York is currently hosting an exhibition titled “Modigliani: Beyond the Myth” (until September 19th). The Jewish Museum? Modigliani? Why you ask? Because Modigliani was a Jew of course! By all accounts, Modigliani benefited from a rich Sephardic heritage, aided by the fact that the part of Italy he lived in (Leghorn) had no ghetto walls and was extremely tolerant towards the Jews. “He is known to have frequently announced “je suis Modigliani, juif” — “I am Modigliani, the Jew” — and to have vociferously attacked anyone who made an antisemitic remark.” He had a Bar Mitzvah and a Rabbi officiated at his funeral. So why the question? Isn’t art created by a Jew, Jewish art by definition? Apparently it’s not so clear. For instance, unlike his contemporary Chagall (“widely considered a Jewish artist”, Modigliani never experienced a strong measure of anti-semitism growing up. Modigliani made little use of Jewish themes in his work – no evocative shtetl scenes, no accoutrements of ghetto life, no use of “Jewish imagery and myth” etc. Well, it’s ambiguous if Judaism is defined on the basis of ghetto life and anti-semitism. That however is a very Eurocentric approach that ignores the historical experience of many Jews that was not defined by similar experiences of anti-semitism. It is also reflective of a very contemporary, secular Jewish approach whereby Jewish identity, stripped of most of its Jewish tradition, is left with only anti-semitism as a focal point of its distinctiveness. I always thought that a Jewish identity based primarily on anti-semitism and victimhood kinda, well… sucked. The implication is that but for anti-semitism, one would never have opportunity to express one’s Judaism. I also think that the issue of Modigliani’s Jewishness diminishes his particular Jewish upbringing – a typical response from a primarily ashkenazic Jewish society almost blind to the existence of different Jewish experiences. Modigliani’s sephardic Jewish upbringing was by all indications very cosmopolitan and bereft of the influence of a society closed to his kind. His art work reflects this open minded, worldly sensibility. Why is that any less Jewish than fiddlers on roof tops and flying goats? So, to answer the question – How Jewish is Modigliani? Well… at least as Jewish as Chagall. Just as Jewish as any Jew. Why is that even a question? The exhibition continues at the Jewish Museum in New York until September 19th. Two other exhibition sites follow: The Art Gallery of Ontario in Toronto, October 23, 2004-January 23, 2005; The Phillips Collection, Washington D.C., February 19 – May 29, 2005. ← Previous Story Reform Jews want Congress to not be so Pro Israel. Sort of. Art made by a jew doesn’t really seem to make it Jewish art anymore than pork made by a jew makes it Jewish food. That isn’t to say that Modigliani shouldn’t be in the museum; but I don’t like the inference pattern you are using at all. You’re sooo literal-minded Stenis sur la menace. Chagall’s paintings were reflective of his experience which happenned to include ashkenazic Jewish iconic imagery. Thus, no one has a problem characterizing his art as “Jewish.” Modigliani’s experiences were different from Chagall’s – but does the absence of readily identifiable Jewish imagery render art created by a Jew any less Jewish? Does all Jewish art HAVE to contain, I dunno, bagels? or fiddlers? or dancing Hassids? Geez, I hope not. As for your example, pork made by a Jew is definitely more Jewish than pork made by a non-Jew. 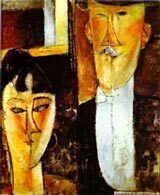 Modigliani’s art: Jewish art? I don’t know if it’s a very useful term — it prob’ly depends on what the person using it wants to know. If they’re trying to figure out what art made by Jews says about Jewish integration into life in 19th c Italy and France then, sure, they want to consider Modigliani. (Integrated.) If they’re trying to learn more about the marriage of Jewish themes with European art styles or how painting has been undertaken with respect for traditional Jewish prohibitions on graven images, then Modigliani’s not such a great example to consider. So it’s just one of those things. (Sort of like the nutty and never-ending what is Jewish music discussion.) Should the Jewish Museum in NYC show him? Why not — he was Jewish, he was a famous painter, sounds good to me. What is Jewish music? Uh… the Ramones? Ultimately, does it really matter? I’m with neither of you. To be Jewish Art isn’t interest relative; that would imply that if you dont’ want to know anything but just look at a picture, it couldn’t have jewish content. Clearly you can miss the jewish content even if you are not looking for it. As for ck, please. you know the inference pattern from ‘X made by jew -> Jewish X’ is fallacious. For instance, a fellow named David Kaplan wrote one of the more famous papers in the philosophy of language called ‘Demonstratives’, which contains a good hard look at what the meaning of ‘that’ used demonstratively as well as a model theoretic account of context and indexicals like ‘i’,’now’ and ‘yesterday’. Your’e going to tell me that that is *jewish* philosophy? You’ll have a lot of angry real jewish philosophy writing fellows at your door. Lucky for you, they are all weiner academics. Man I am hungover. No wonder all the rambling. Forgiveness, please! Who is a Jew? What is Jewish Art?